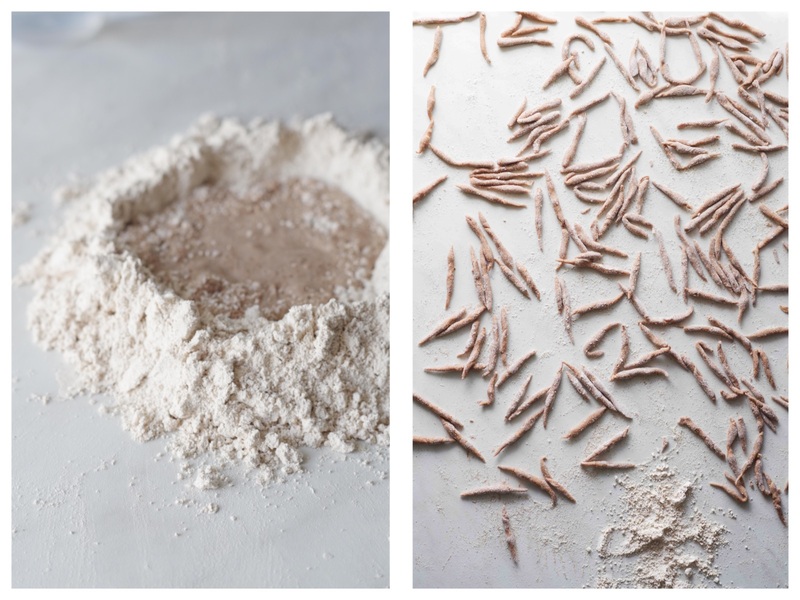 The story of trofie (or troffie or trofiette) speaks of women seated at the kitchen table rhythmically modelling, one by one, with a swift and expert gesture of the palm of their hands, hundreds of little twists of fresh pasta all identical to each other. It speaks of women who spent slow and monotonous hours preparing the meal for their family of whichever day of the week. It speaks of women who also brought home the bacon with the experience matured in years spent kneading the dough, because restaurants and pasta laboratories in the area brought them at home tender wheat and the next day came to pick up the fresh beautiful trofie just handmade, ready to be cooked or to be re-sold. Once the repositories of this household art lived only in the small villages overlooking the Golfo Paradiso, a small gulf closed to Genoa: Sori, Recco, Uscio, Camogli. And even today you can find the few remaining knotted expert hands that make trofie without even thinking hidden between the walls of some small house with wooden window frames and faded red plaster overlooking the sea. 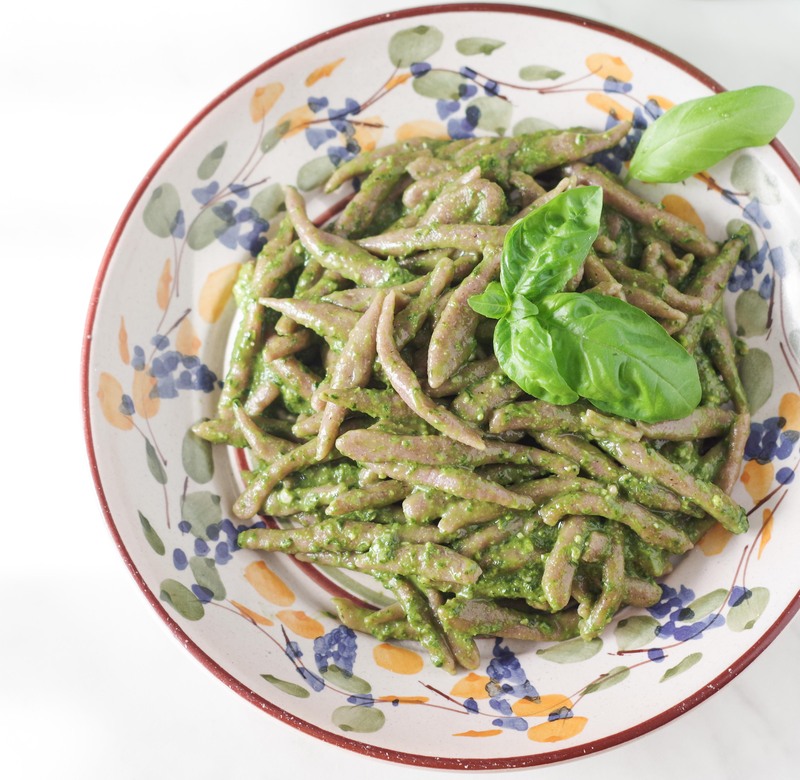 TofIie, now known all over the world, have become famous only since the 1960s when the pasta makers s of the area began to widen their market and to offer this special pasta also in the city and along the East Italian Riviera. The success was so rapid that the time to make them by hand was not enough anymore and so the first artisanal machines were invented. From there the jump to the “dry”, longer lasting, version was short. This allowed the trofia, once a small-town fresh pasta, to travel around the world on the harm of pesto sauce, his faithful spouse. 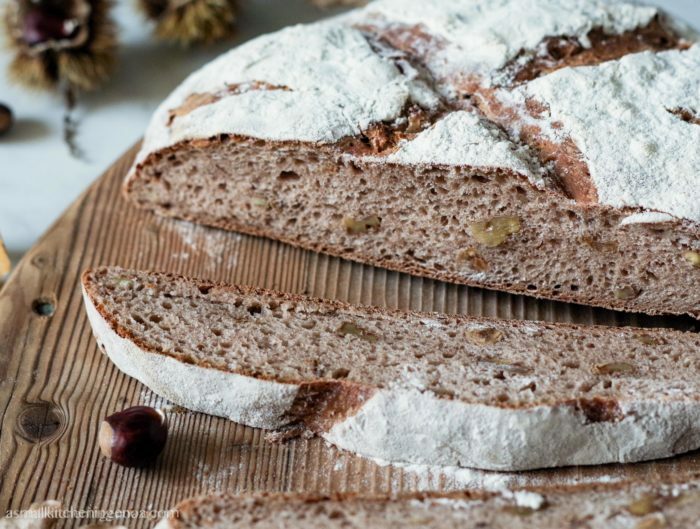 In autumn and winter, trofie were prepared with the addition of chestnut flour as in the Italian Riviera backcountries chestnuts trees were abounding and chestnuts were much cheaper than white wheat, which was most of the times imported. If you are curious about the nice story of chestnuts in the Italian Riviera, you can have a look at my post “Dried Chestnuts of Bormida Valley”, a slow food presidia of Liguria. 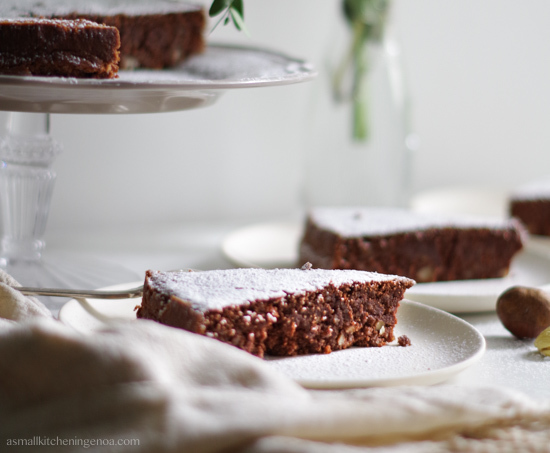 Chestnut trofie have an ancient flavour, slightly sweet and smoked. 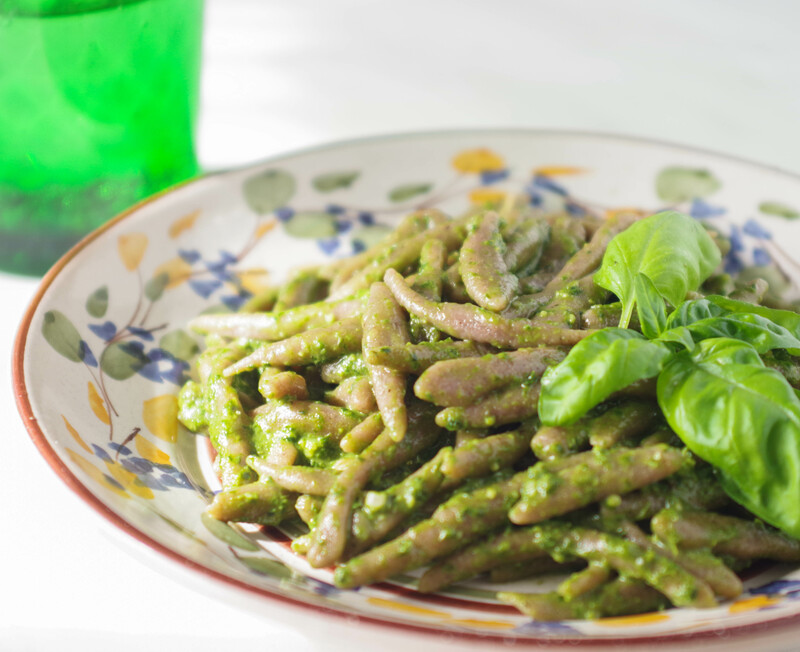 Their favourite seasoning is always pesto sauce, maybe a little “rude” pesto made with a lot of garlic and pecorino cheese. Traditionally, though, they also go with a simple milk and cheese cream. The story that trofie take with is definitely intimidating, but I do not surrender that easily, especially when it comes to bake up some dough. So I decided to do trofie by hand, like Sori housewives used to a long time ago. I admit it takes a bit of practice but you get it pretty fast. Certainly one is not immediately able to model wonderful shavings perfectly screwed and all of the same size. Just thinking it as possible would mean disrespecting the ancient tradition. But just with a little patience one can make lots of tapered sticks that pick up the sauce very well. And when they are there, all closed to each other completely dusted with flour, they give such a great satisfaction! 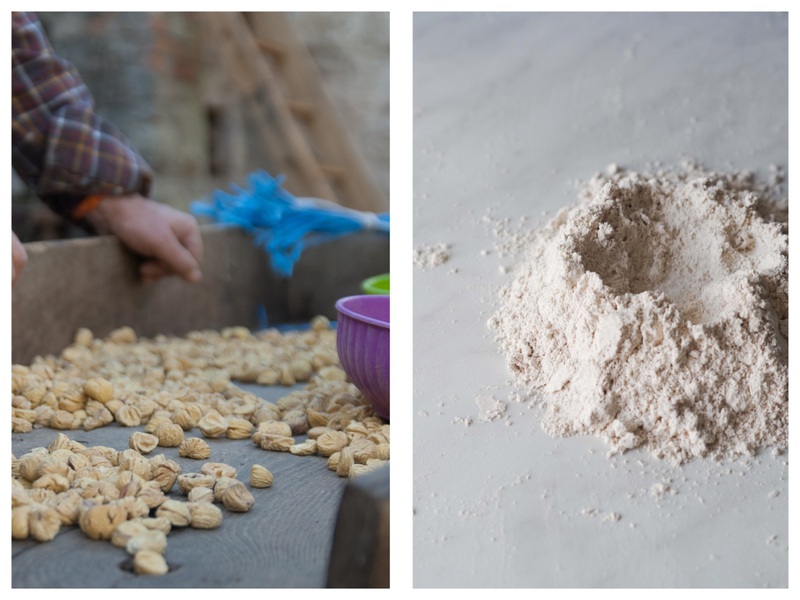 Sift the chestnuts flour and the white flour on the working surface, mix and collect in a small mountain. With your fingers, make a hole in the centre like a crater. Pour into 1/2 teaspoon of salt and half of the lukewarm water. Begin to mix the water with two fingers by gradually dropping in the flour from the sides of the crater. The dough will begin to solidify. When the dough begins to "stay together", vigorously work it on the floury working surface by folding it on itself and crushing it with the lower part of your palm many times. If the dough is too dry or floury, add a small amount of water simply by moistening the palm of your hands. Repeat if necessary until you get a compact and elastic dough. Divide the dough into 5 small balls of equal size and cover with a damp cloth. Take one of the balls (the rest must remain under the damp cloth so that they don’t dry out) and with the palms of your hands shrink it in chord as thin as a small finger (about 8 mm in diameter). With a sharp knife cut the chord sideways in many slices (like rhombus, they must be pointy at the extremes). Then take a piece and let it roll in the palms of your hands back and forth to stretch and tighten it slightly. You will get a slightly screwed chip: the “trofia”. Continue until the dough is finished. There is another technique more complex and that requires a great deal of skill: cut the chord (for straight, not sideways) into pieces long about 1 cm and then curl them one by one with a fast motion of the palm of your hand (especially with the outside of the little finger), rubbing them on the working surface back and forth. 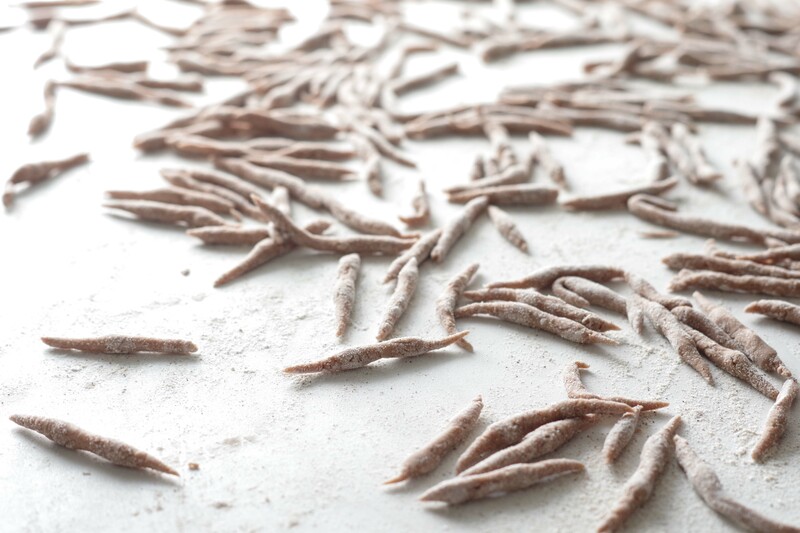 Remember to place the trofie on a surface well dusted with floor and to sprinkle over them abundant flour so to avoid that they dry and stick to each other. Cook them in plenty of salted boiling water for about 6 minutes. 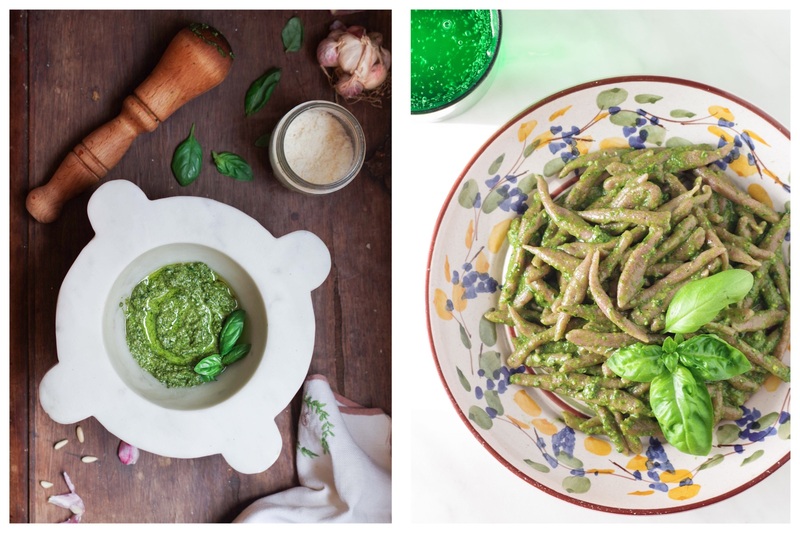 Season with pesto sauce (remember always to save a cup of boiling water and to water down the pesto with it before pouring on the pasta) or with a cream made just melting grated cheese (Parmesan Cheese of Pecorino Cheese will be perfect) in some hot milk. If you need to see a gesture to understand it, like I do, here there are a couple of the most interesting videos I found on youtube: traditional method, another traditional method, and simplified method for beginners. 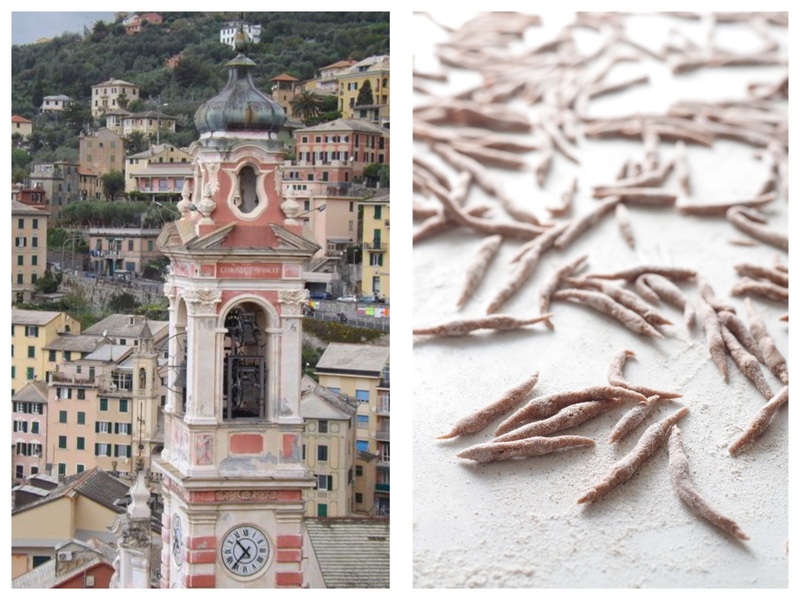 If you are in Genoa and want to buy some great fresh trofie here are my suggested pasta makers: Pastificio Danielli, in Via Galata, in front of the Old Fruit Market (Mercato Orientale) and Tiziano, in the neighborhood of Quinto (on the seaside) Via Giannelli. 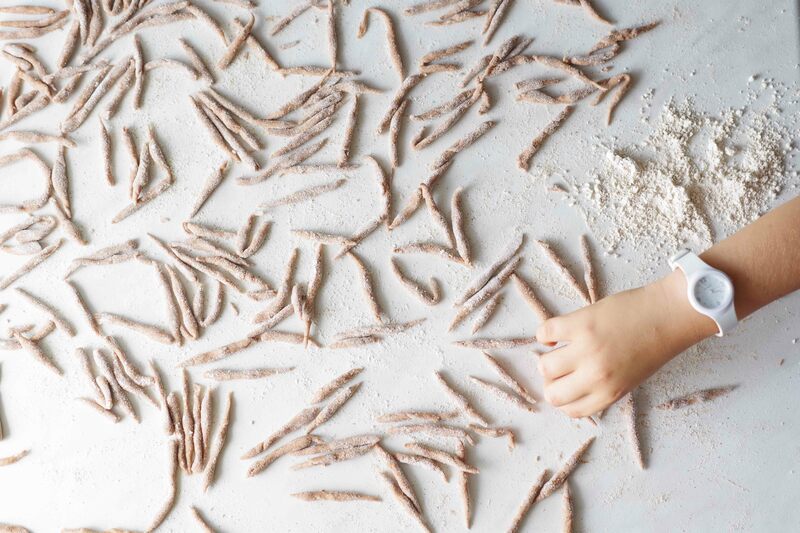 Did you enjoy in hand making traditional fresh pasta? 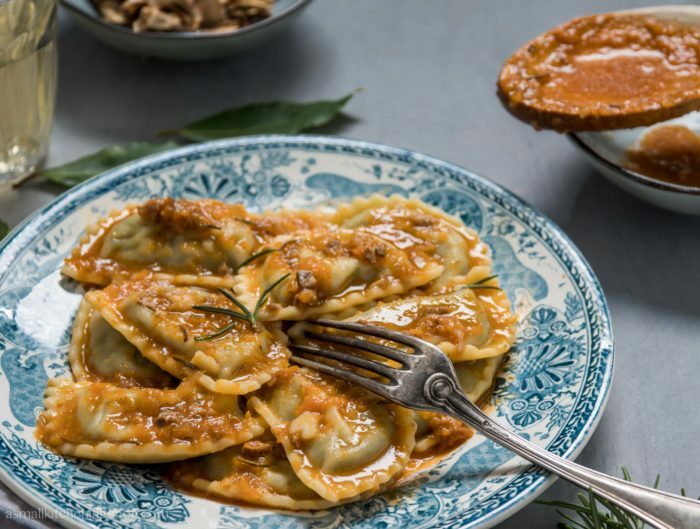 Therefore you must try also piccagge verdi (a green homemade pasta) or corzetti or even pansotti (the traditional Italian Riviera ravioli filled just with herbs)! thank you for reading my blog! I thing that the issue is making trofie with a harder dough. However you shall know that most of trofie that you see in the pictures where bought already made, not handmande. And the pasta shops/pasta makers use special machines for shaping the pasta…with hard dough…:) So don’t be so much depressed! Just try making a harder dough and cooking them for less time :).